On Dec. 13 the Ukrainian parliament questioned government ministers about problems connected to the Chornobyl Nuclear Power Plant, which was shut down exactly five years ago. Unlike the plant itself, the question of radioactive waste disposal remains open. Another reason for broaching the Chornobyl topic was a statement that President Yushchenko made during his recent visit to the power plant. The president shared his plans to approve a plan to store other countries’ nuclear waste in the Chornobyl area. Chornobyl is already contaminated and separated from the “mainland” by four zones of alienation, says the president, declaring that there is probably no safer dumping ground in the world than Chornobyl. Beset with the problem of nuclear waste, civilized countries would pay generously to dispose of it, while Ukraine could use the revenue for current repairs to the power plant’s “sarcophagus” and completing the construction of a reactor shelter and a nuclear waste storage facility. President Yushchenko promised, however, that this decision will not be adopted unless the public approves. The latter didn’t waste any time demonstrating its attitude to the project: last Tuesday angry statements started flying from every direction, and the Green Party of Ukraine launched a permanent protest action under the slogan, “Let’s Stop Ukraine from Becoming Europe’s Nuclear Dump.” The first stage of this action was a rally in front of the Presidential Secretariat. Experts say that Ukraine should first think about constructing a reliable storage facility for its own wastes and dismantling the fourth damaged reactor — the radioactive materials still have not been removed. This requires the use of robots because this kind of work has a lethal effect on people. We must also locate and rebury the waste from those 1,000 small waste storage facilities. All this will cost money. Where will we get it? It is clear that we won’t earn anything by “importing” European waste because there can be no question of new waste before a reliable storage facility is built. But even after that Ukrainians will hardly approve setting up an international nuclear dump in this country. 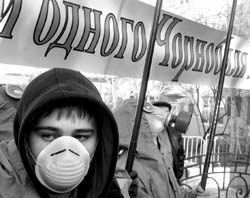 Another Chornobyl-related public outcry was caused by the cancellation of benefits for Chornobyl cleanup veterans. On Dec. 13 the Chornobyl Union of Ukraine staged a rally in front of the Verkhovna Rada of Ukraine in order to draw the MPs’ attention to the social problems of the Chornobyl liquidators. Approximately 2.9 million people in Ukraine were affected by the Chornobyl disaster. The rally was attended by about a hundred people. Next year’s budget abolishes benefits for the liquidators, individuals who suffered from the explosion, and their relatives. But Vice-Prime Minister for Humanitarian Matters Viacheslav Kyrylenko has promised to increase pensions by three or four times for Chornobyl cleanup veterans (1st and 2nd class), disabled veterans who took part in the cleanup operations in 1986-1990, and some other categories of people. “One must always see a real person behind financial and technical problems. This will be the principle of work guiding the cabinet, the ministry for emergencies, and other agencies related to the Chornobyl cleanup and shutdown,” said Minister for Emergencies, Viktor Baloha, last Tuesday during the parliamentary question period. He noted that the decisions that were passed by the president, cabinet, and Verkhovna Rada about decommissioning the Chornobyl nuclear power plant are not being fully implemented owing to budgetary under-funding. He said that this year work was completed to stabilize the structure of the Shelter and to design and install a comprehensive system for radiation and seismic monitoring of stable structures.